More that sixty years ago, psychiatrist and neurologist Dr Viktor Frankl found himself interned in a concentration camp. Yet despite the harsh and in fact, lethal environment, Frankl was able to evaluate objectively the morbidity and mortality that surrounded him. In effect he noted that fellow inmates would succumb to malnutrition, infection (typhoid, typhus or TB) or be exterminated if they were no longer able to work. Preceding the development of this pre-terminal situation was the prevalence of a mind state of despair, characterized by the traits of hopelessness and meaninglessness. Today this mind state would be loosely referred to as hopeless-helpless. This pioneering work which postulated that a pre-existing negative mind state could give rise to a chemical process that could suppress immunity and other aspects of metabolism, was subsequently proven in research performed in the early seventies. Animal studies performed by Ader in Rochester, New York confirmed that immunity in animals could be manipulated by neuropsychological conditioning. This established the field of psychoneuroimmunology (PNI) � the study of the influences of neuropsychological processes on immune function. Subsequent clinical research confirmed the existence of a suppressed immunity in certain life situations which in many cases were associated with the presence of chronic infection, inflammation and tumour formation. These life situations included amongst others, bereavement, anxiety and depression. Over the past eight years research in PNI has accelerated significantly. In most of the PNI research centres around the globe the research has incorporated the combined contributions of multiple disciplines and departments. It is not uncommon therefore that psychologists/psychiatrists, neurologists, immunologists, endocrinologists and more recently, cardiologists, co-operate in a common PNI research program. As a result the pathways as well as the details of the chemical interactions have been elucidated. At the core of PNI chemistry are the pro-inflammatory cytokines Interleukin-1, Interleukin-6 and Tumour Necrosing Factor Alpha (TNF-α). Exogenous stress and anxiety may give rise to the hopeless-helpless mind state which may or may not evolve into depression. This endogenous subjective mind state is associated with a decrease centrally, of serotonin and an increase in noradrenalin. This neurotransmitter configuration results in the stimulation of immune cells in peripheral blood and the subsequent secretion of pro-inflammatory cytokines (see figure 1). Gives rise to immuno-suppression, most notably of natural killer (NK) cell activity. 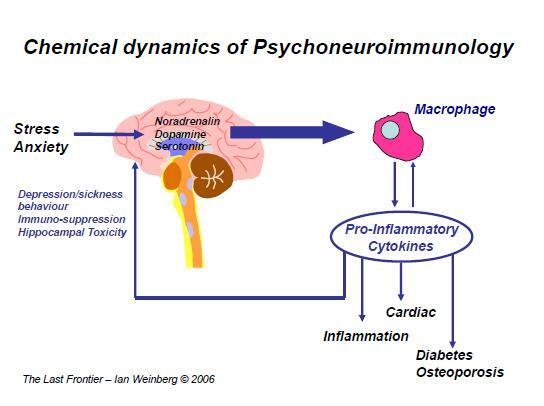 In addition to the abovementioned actions, the pro-inflammatory cytokines feedback on the brain. In this way they further perpetuate pathological neurotransmitter concentrations. More ominously however, the increased pro-inflammatory cytokine concentrations give rise to cerebral dysfunction, most notably within the hippocampus. The hippocampus is the region of the brain responsible for short-term memory and stress buffering (contextural memory). In the chronic situation this results in hippocampal atrophy and subsequent loss of short term memory. More recent studies have also shown an association between hippocampal atrophy and the subsequent development of Alzheimer�s disease. It has also been shown however that the hippocampus manifests a degree of neuro-plasticity in that optimal and timeous intervention can in fact lead to a degree of hippocampal regeneration. Some of the more recent clinical studies performed by Kiecolt-Glaser have shown an unequivocal association between negative mind states, increased pro-inflammatory cytokines, suppressed NK cell activity and the increased occurrence of carcinoma (melanoma). Comprehensive intervention has prolonged survival as well as quality of life. In the context of PNI, successful intervention requires a combination of conventional end-organ treatment (medication, surgery, radiation etc), as well as psycho-therapeutic management. The latter management is critical in the overall intervention in that the psycho-social circumstances may well be the precipitating factor which has initiated and perpetuated the chronic rise in pro-inflammatory cytokines. In this regard it has been shown that young individuals that have suffered severe myocardial infarctions ('heart attacks') have often found themselves in subjectively perceived hopeless-helpless life situations, preceding the infarction. It may well be that the negative mind state emerging from the stressful environment has given rise to chronically raised pro-inflammatory cytokines, accelerated athero-thrombosis and possible heart muscle (myocardial contractility) dysfunction. The DNA molecule incorporates all our inherited determinants. Until fairly recently it was accepted that this fundamental molecule remained constant and unchanging throughout our lives. However this understanding is no longer true. For it has been shown that there are profound PNI influences which may bias the expression or suppression of the DNA molecule and thereby change aspects of body structure and function. Actively dividing DNA requires that the order of chemicals forming the building blocks of the molecule be accurately replicated in structure and sequence. From time to time, splicing problems may occur such that abnormal DNA strands are formed. The danger inherent in this situation is that abnormal DNA may give rise to tumour formation if the abnormality is allowed to perpetuate itself. Fortunately there is an enzyme in all cells which acts to restore the abnormal strand back to normality. It has been shown however that the function of this enzyme may be suppressed by a negative (hopeless-helpless) mind-state. Thus the chemistry of PNI can be seen to impact on the very core of genetic transmission. It becomes apparent that we can no longer disregard the neuro-psychological influences that have been shown to impact upon general body metabolism. As a result, the successful management of such conditions as chronic depression, tumours, chronic inflammation, infection, athero-thrombosis, Type 2 diabetes and osteoporosis requires a multi-modality approach which necessarily includes a comprehensive psycho-therapeutic intervention. However the rapidly evolving science of PNI extends beyond the realm of merely providing an explanation for a multitude of medical conditions. There is the realization that the chemical interaction between the mind/brain and the body is nothing less than the chemistry of performance. For indeed wellness and performance are two sides of the same coin. Appels A, Bar F.W., Bar J, Bruggeman C, de Baets M. (2000). Inflammation, depressive symptomatology, and coronary artery disease. Psychosom Med; 62: 601�5. Charney, D.S., Manji, H.K. (2004). Life stress, genes, and depression: Multiple pathways lead to increased risk and new opportunities for intervention. Sci. STKE 2004, re5. Freund, G.G. (Ed). Neurologic Clinics: Psychoneuroimmunology. (2006). Vol 24, No. 3. Kiecolt-Glaser, J. K., Preacher, K. J., MacCallum, R. C., Atkinson, C., Malarkey, W. B., & Glaser, R. (2003). Chronic stress and age-related increases in the proinflammatory cytokine interleukin-6. Proceedings of the National Academy of Sciences, USA, 100:9090-9095. Kiecolt-Glaser, J.K., Robles, T.F., Heffner, K.L., Loving, T.J. & Glaser, R. (2002). Psycho-oncology and cancer: Psychoneuroimmunology and cancer. Annals of Oncology, 13(Supplement 4): 166-169.